Our kids will go through ice pops like water in the summer… well, let me restate that, they will eat as many as I will let them regardless of the weather outside. During the hot days of summer, I want them to stay hydrated and I also want them to get good nutrition. We are drinking lots of flavor infused water and gobbling up all kinds of frozen creations. We like commercial molds because they contain all the necessary pieces and use a smaller space in the freezer. However, ice cube trays & cups work well also. For reusable “sticks” opt for plastic spoons or other easy to clean item. We go through about 24 a day so I just toss things into the blender until its full, leftovers can be a nighttime snack! Smoothies- toss yogurt, milk of choice, fruit and sweetner (honey, agave or maple syrup if desired) into the blender. Process until smooth and pour into molds. Juice- simply make and pour juice into the molds. Fresh juice through the juicer is always best. This way you can use a carrot juice base and it will still be fruity-delicious! Fruit- toss bits and pieces of berries, banana slices, peaches, etc… into the molds then fill with apple juice. Chocolate- make chocolate milk using cocoa, agave and milk of choice (rice, soy, goat, etc…) and pour into molds. Add banana slices for a wacky monkey pop. Flavored water- this is a lighter take, less nutrional value but no junk… it’s like pure water but with a kid friendly taste. See instructions below for making your own infused water. You can add fruit pieces here as well. If you are looking for more flavor ideas, check out Pops! Icy Treats for Everyone by Krystina Castella. Tiffany has a great recipe for veggie pops, Vanessa has one for Organic Homemade Pops with carrots & berries and Cheryl has one made with Tofu in her vegetarian recipes for kids. Freeze overnight and enjoy! We keep a bowl on the counter for molds and sticks to go in throughout the day and then add to the dishwasher after dinner or wash up by hand. Wash the glass jar and lid. Wash fruit. Berry infused water- Crush berries lightly, place in jar. Add 3-4 slices of lemon. Fill jar with water and cover. Allow to sit in sun for several hours. Citrus infused water- slice 1-2 citrus fruits (lemon, lime, orange)… we like to combine them! Place in jar, fill with water and cover. Allow to sit in the sun for several hours. Once the fruit has had time to infuse the water, strain liquid off by placing a cheesecloth (double or trip thick) over the top and pouring the water into your serving pitcher. Another option is to make flavor bags out of cheese cloth and string, place the fruit inside and drop it into the jar, leaving a piece of string over the top. When the water is ready, simply remove the bag and leave the water in the jar. You should be able to reuse the fruit for several gallons of water. (Store in the fridge between uses.) Or simply toss them into a smoothie or ice pop. Some people enjoy lightly sweetened flavored water, if you are one of them use agave, honey or maple syrup (3-4 Tablespoons or to taste). 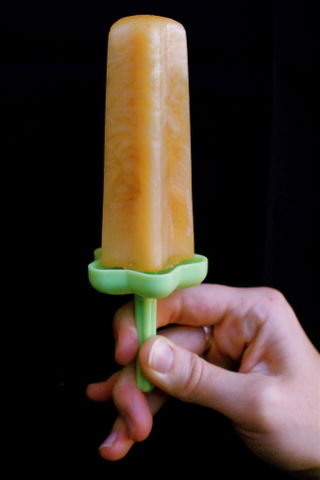 Photo Credit: Apple Cider and Rosemary Ice Pops by The Bitter World on Flickr, under Creative Commons. Isn’t leaving a jar of water + smashed fruit in the sun for hours a breeding ground for bacteria? Like “sun tea”?